Whether you're an old pro or just joining in the fun, My Doll's House offers everything for the miniature enthusiast, from dollhouse kits and miniature room boxes to furniture and accessories. Building a dollhouse is a fun and entertaining hobby for the whole family, providing many hours of enjoyment. You can build a family treasure that can be passed on to future generations. Stop by our store in Torrance, California, to pick up a kit, furniture, and supplies. You'll find everything you need to turn your miniature hobby into a priceless treasure. 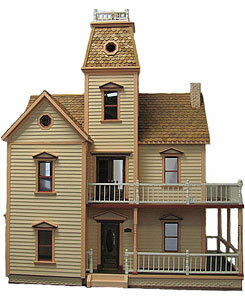 Customize your own unique dollhouse with our incredible selection of kits, furniture, and handcrafted collectibles. Start with a kit and expand from there to add style and special touches. We have all the supplies you need, including one-of-a-kind items, to build a truly unique and beautiful dollhouse. Monday - Saturday: 10:00 a.m. - 4:00 p.m.